Posted on April 28, 2016 at 1:57 am. To celebrate the launch of Microgaming’s latest pokies game, Bar Bar Black Sheep, Royal Vegas Casino is giving away double reward points every time you play this awesome new game for real money wagers. All you need to do to take advantage of this bonus offer is sign into your Royal Vegas Casino account and opt-in to the Bar Bar Black Sheep promo by clicking the ‘Double Up’ button on the promotional banner at the top of the game lobby. Once you’ve opted in, any time you play Bar Bar Black Sheep between now and the 30th of April, your account will automatically be credited with bonus reward points. Under the Royal Vegas Loyalty Rewards Program, every single credit you bet on the pokies will earn you one reward point. 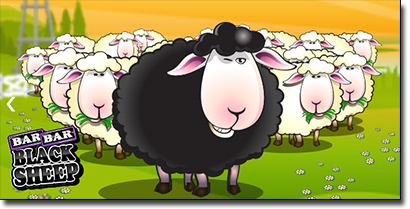 Playing Bar Bar Black Sheep as part of the double rewards promo is a great way to boost your points without having to double your bets, where betting 50 credits on Bar Bar Black Sheep will earn you 100 rewards points rather than the standard 50. As the name suggests, Bar Bar Black Sheep is based on the classic nursery rhyme and uses a farm yard theme with a happy soundtrack. It’s a five reel, 15 payline video pokies game and a modernised version of an older Microgaming slot of the same name. The bright and cheerful reels are filled with symbols of corn, oranges, watermelons, eggplants, apples, barns and cheeky black and white sheep. Along with being one of the better looking Microgaming releases of late, Bar Bar Black Sheep has multiple bonus features including wilds, scatters, random multipliers, and a free spins bonus which can earn you up to 20 free spins where all wins are multiplied by three. If you’ve been disappointed by Microgaming lately, you’re not alone, but Bar Bar Black Sheep will restore your faith this gaming giant still has what it takes. Sign up with Royal Vegas Casino before the 30th of April to take advantage of this double reward point offer. If you’re new to Royal Vegas, register for an account using our links to claim up to $1200 in matched deposit bonuses over your first four deposits which can be used to sample the huge collection of Microgaming pokies and table games on offer in the Royal Vegas instant-play and downloadable casino.